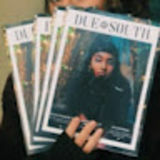 Due South is the first student-run, lifestyles magazine of the University of South Alabama in Mobile, AL. Since its founding in 2012, the magazine has strove to capture the true spirit of USA and the Mobile area, with its diverse trends, styles and attitudes. We regularly spotlight art, music, people, destinations, entertainment, taste and more. Our bi-annual publication is targeted to our student body and a community each spring and fall.